Disruptive forces continue to shape global markets, and Taiwanese businesses can take advantage of opportunities emerging amid these transformative trends. Rapidly changing political, economic and other factors in markets around the world all have the potential to disrupt Taiwanese companies engaged in cross-border business. The UK's decision to "Brexit" from the European Union, the uncertain enforcement priorities of a new US presidential administration, potential policy shifts in China and recent upheavals in Asian multinational trade agreements create challenges for Taiwanese businesses venturing nearly everywhere in today's increasingly complex, fragmenting world. These are just a few of the volatile forces affecting cross-border business. Yet opportunities exist amid the global uncertainties. 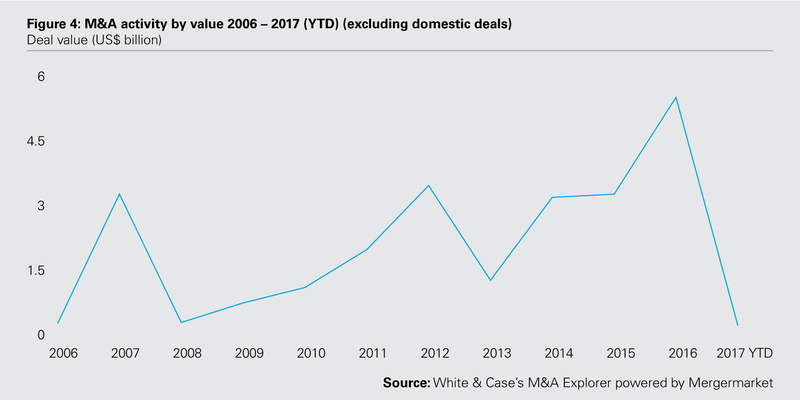 Both inbound and outbound Taiwanese M&A activity has remained strong so far in 2017. The Asia-Pacific region, more broadly, recorded its highest-ever private equity (PE) buyout value in 2016. Recent financing transactions throughout the Asia-Pacific region highlight some intriguing trends. 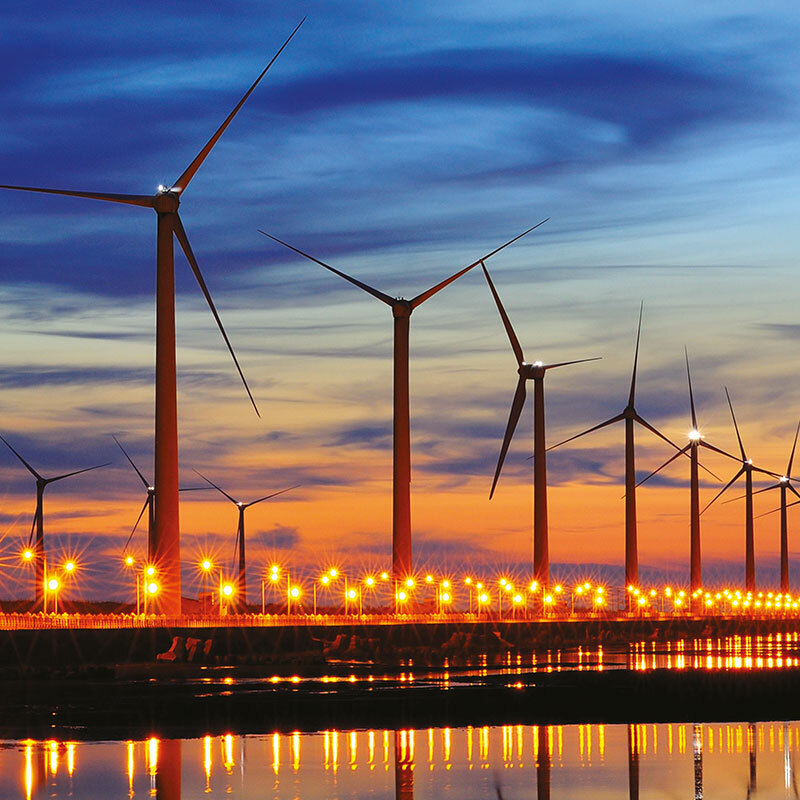 And just as the US is pulling out of the Paris Climate Agreement, Taiwan and other countries are expanding their investments in renewable energy and related technology. 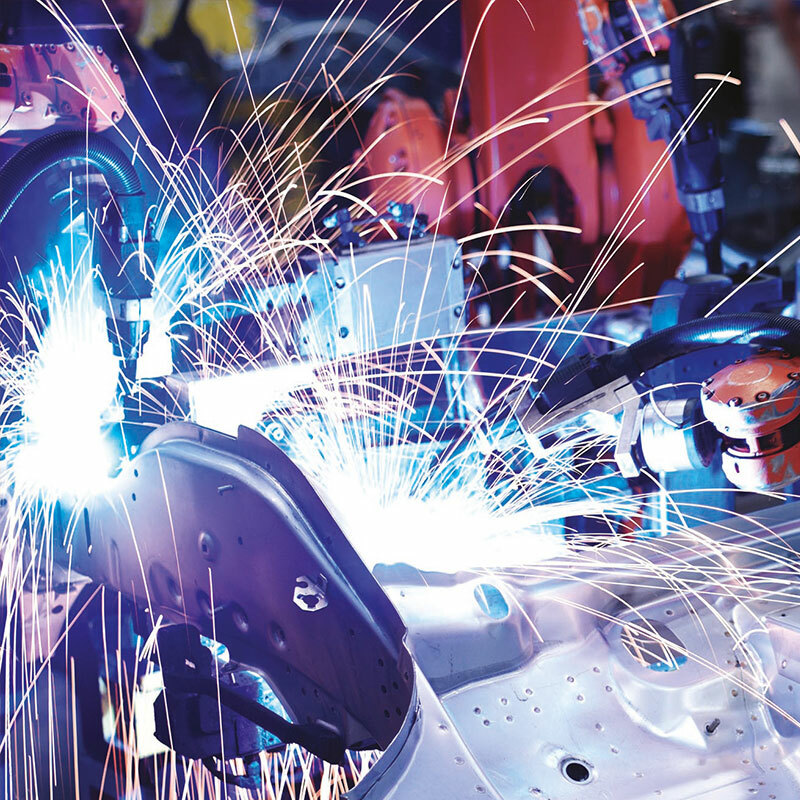 Groundbreaking technological advances are adding value in nearly every industry sector. Current developments, moreover, could be creating the right conditions for Taiwan to negotiate new trade agreements. For Taiwanese businesses, the implications of these and other global changes are broad. Here is a quick glimpse of several risks and potential opportunities we currently see ahead on the near horizon. Spurred by semiconductor company consolidations, TMT activity dominated Taiwan’s inbound and outbound dealmaking in Q1 2017. 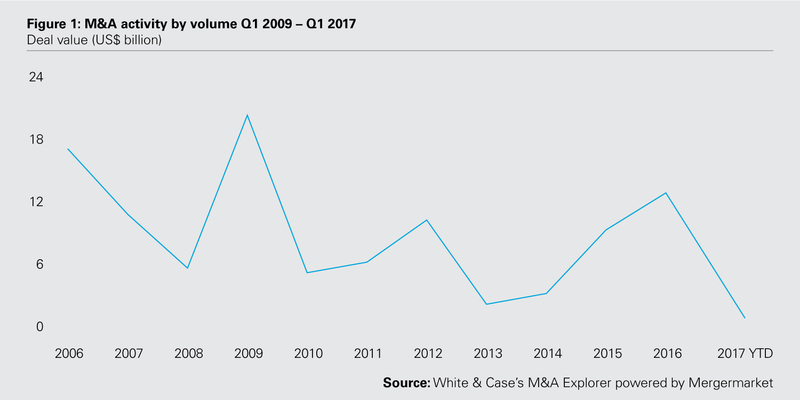 The 2017 kickoff in Taiwan M&A showed the second-highest Q1 deal volume since Q1 2010, with 13 deals (Figure 1). This matched the Q1 2016 total—which itself was a busy year for M&A in Taiwan. 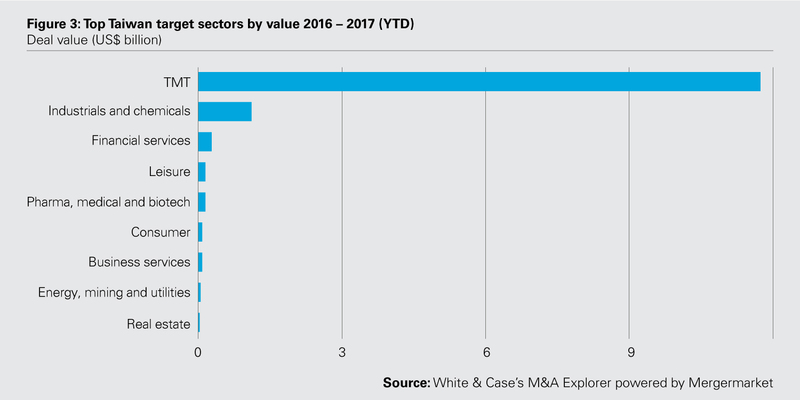 The 2017 kickoff in Taiwan M&A showed the second highest Q1 deal volume since Q1 2010, with 13 deals. Last year's volume of 52 deals was roughly on par with 2015's 55-deal volume. But the aggregate deal value in 2016, which reached US$12.9 billion, was the third-highest on record, behind 2009 (US$20 billion) and 2006 (US$17 billion) (Figure 2). Over the past 15 months, the technology, media and telecom (TMT) sector dominated deal flow for Taiwan-based targets, with 25 deals worth US$11.7 billion (Figure 3). Driven by consolidation in the semiconductor market, the TMT deal flow featured the three largest Taiwan inbound M&A deals in 2016. 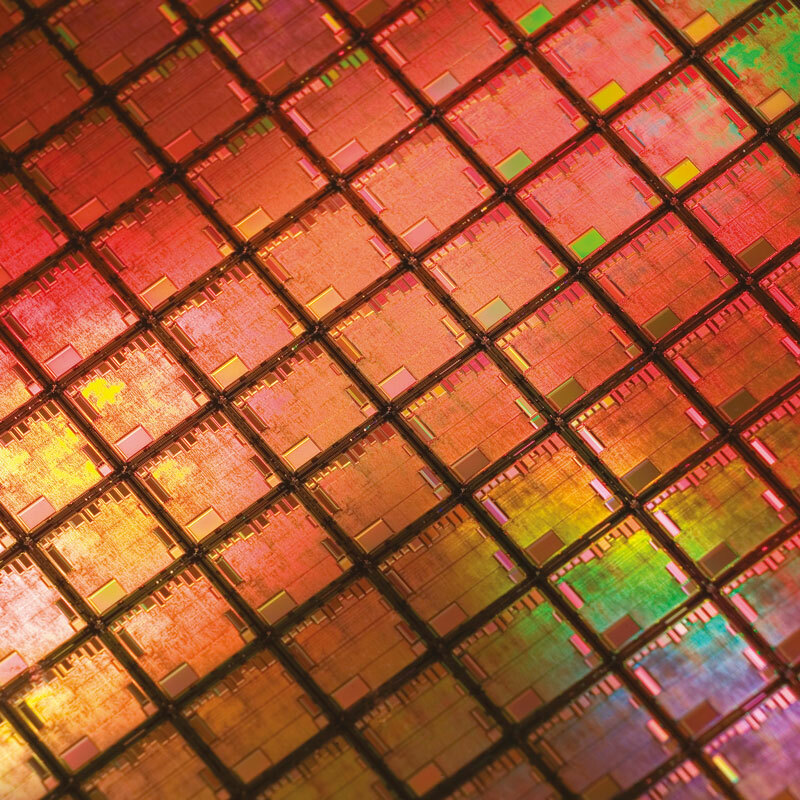 US-based Micron Technology took control of the remaining 67 percent stake it did not already own in Taiwan's Inotera Memories, for US$3.6 billion. Taiwan's Advanced Semiconductor Engineering agreed to acquire the 67 percent stake it did not already own in its domestic counterpart Siliconware Precision Industries for US$3.4 billion. And Netherlands-based ASML Holding agreed to acquire Taiwan's Hermes Microvision for US$2.8 billion. Outbound activity from Taiwan also hit a record high in 2016, with 37 deals worth US$5.5 billion (Figure 4). TMT activity also dominated outbound activity, with 17 deals worth US$4.1 billion. By value, the most important outbound market was Japan, while volume was highest in the United States (nine deals worth US$900 million) and China (eight deals worth US$600 million). In the largest outbound deal from Taiwan, a consortium comprising Hon Hai Precision Industry, Foxconn Technology and SIO International Holdings agreed to acquire a 66 percent stake in Japan's Sharp for US$2.5 billion. Europe's complicated geopolitical "divorce" may affect cross-border commerce. As the Brexit proceedings begin to unfold, think carefully about your supply chain indirectly into the UK. Since the United Kingdom (UK) joined the European Union (EU) 44 years ago, the UK and the EU had been working to progressively integrate their legal, economic and financial systems. Then last year, UK voters opted to "Brexit" from Europe. And in March 2017, the UK formally triggered the Article 50 process to begin negotiations for Brexit—thus launching one of the most complicated divorces in world history. The news has been full of confusing, sometimes speculative discussions of how Brexit could affect cross-border businesses. To help make sense through the noise, here is a brief summary of what is happening with Brexit and the impact it could have on Taiwanese businesses. The UK is now scheduled to leave the EU by March 2019. There are two likely ways for it to do this. The first exit option is that the UK would stop being an official EU member, but would agree on transitional arrangements and a future relationship with the EU, with the aim of minimal disruption to the current UK-EU integration. While that would be tough to achieve, it would be possible for the UK and EU to negotiate a deal over the next 18 months or so. This would involve compromising on a difficult set of issues, including the legal and financial consequences and the details of what the future relationship between the UK and the EU would look like. Given the unprecedented complexity of this deal, there is a significant chance that the EU and UK will not be able to agree on all relevant details by March 2019. In addition, political considerations are likely to play a significant role here and could prevent a deal even if the technical negotiations were bearing fruit. For political reasons, the UK government has ruled out accepting free movement of people and the legal jurisdiction of the European Court of Justice post-Brexit, which makes a compromise more difficult. At the same time, EU leaders will not wish to let the UK just "walk away" from the EU while retaining all economic benefits of membership. The second exit option would involve severing the UK's trading relationship with the EU through a "hard" exit. In this case, the UK would trade with the EU—and the rest of the world—on the basis of the rules of the World Trade Organization (WTO). The UK has said that it intends to maintain the WTO commitments that it currently offers as an EU member. WTO rules currently provide the basis for key trading relationships around the world, including between the EU and the United States. After a hard Brexit, the WTO framework would cover most (though not all) aspects of trade between the UK and the EU and other WTO member countries, like Taiwan. The UK would then need to build on WTO rules through new free trade agreements and address some tricky WTO issues as a consequence of its exit from the EU. For Taiwanese businesses, no matter what type of scenario results from the current Brexit negotiations, the UK's departure from the EU will not change any aspect of Taiwan's trade directly into the remaining EU member countries. Similarly, Taiwan's cross-border trade directly into the UK may remain unchanged for a while. At least in the beginning, the UK is likely to keep similar external tariffs and schedules in place. The main area of complication for Taiwanese businesses to watch closely is cross-border trade indirectly into the UK via Europe. This indirect trade route into the UK likely will become more complicated post-Brexit, even if there is a UK-EU deal. And if no deal results, there is the potential for a more significant disruption of trade, especially as new systems are put in place. For example, if your company or an entity you invest in currently ships goods to the UK after delivering, manufacturing or adding value to those goods in an EU country, then this may be a good time to review alternative options. As the Brexit proceedings begin to unfold, think carefully about your supply chain indirectly into the UK. Beyond that, they are unlikely to create immediate concerns for Taiwanese business. Recent international developments could impact Taiwan’s global competitiveness while opening opportunities for new trade negotiations in the Asia-Pacific region. 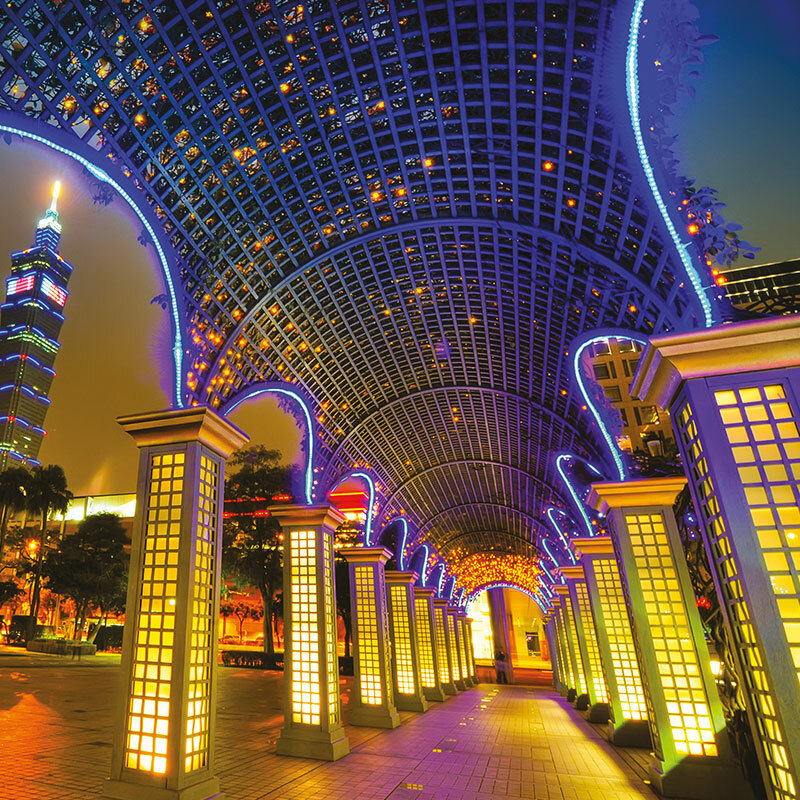 Taiwan ranks 14th in the world for global competitiveness. Compared to its neighbors, Taiwan is party to very few trade agreements. This puts Taiwan at risk of an increasing competitive disadvantage in global trade and investment. For this reason, new developments in 2017 with the Trans-Pacific Partnership (TPP) and the Regional Comprehensive Economic Partnership (RCEP) agreements present some important challenges and opportunities for Taiwan. What does US withdrawal mean for the TPP and Taiwan? One of the Trump Administration's first actions earlier this year was to withdraw from the TPP, explaining it will focus instead on bilateral trade agreements, which it believes will yield better terms for the US. Initially, this appeared to end all prospects for the TPP, which Japan's prime minister said made no sense without the US. However, the remaining 11 parties to the TPP, who spent more than 10 years negotiating the US-led agreement, recently agreed to "assess options" for bringing a "TPP-11" into force without the US, even though the volume of trade among the TPP-11 would be barely a quarter of what it would have been under the original TPP. Japan, in particular, changed course and is leading the effort for a TPP-11 with New Zealand. A key challenge to this effort will be that developing TPP countries like Vietnam and Malaysia, which agreed to concessions in the TPP on the condition that they would obtain improved access to US markets, have demanded renegotiation of the TPP-11 to realign the balance of costs and benefits without the US. No matter what happens with the TPP itself, some of its achievements are likely to carry over into new US bilateral agreements and possibly other multilateral agreements. For example, TPP-like services and e-commerce chapters may be included in the multilateral Trade in Services Agreement (TiSA) currently under negotiation. And TPP-inspired provisions for trade in goods, services, IP or investment could become part of an upgraded RCEP agreement. For Taiwan, these new developments are relevant in two key respects. First, if Japan is successful in its efforts to revive the TPP, a second tranche of countries may have an opportunity to join the TPP—including Taiwan. Joining the TPP would deliver unique benefits for Taiwan, which could attain state-of-the-art market access and investor protections with 10 countries with which it now has no free trade agreement. Second, current conditions could be right to negotiate a US-Taiwan bilateral free trade agreement, as the US looks for willing partners in the region, thereby opening one of the largest economies to Taiwan exports and facilitating US investment into Taiwan. Taiwan-US goods and services trade totaled approximately US$84.9 billion in 2016. How does the RCEP compare to the TPP? The RCEP is often described, inaccurately, as a China-led agreement competing with the TPP for influence in Asia. In fact, the RCEP is largely an initiative led by the Association of Southeast Asian Nations (ASEAN). It joins together ASEAN members and the six countries with which ASEAN has existing free trade agreements: Australia, New Zealand, Japan, China, India and Korea. The TPP and the RCEP both strive to establish a harmonized, predictable and preferential set of regional trade rules that provide incentives for businesses to locate supply chains within the covered region. Both aspire to be pathways to an Asia-wide agreement under the auspices of Asia-Pacific Economic Cooperation (APEC) called Free Trade Area of the Asia-Pacific (FTAAP). Key membership differences between the TPP and the RCEP are that the United States, Canada, Mexico, Peru and Chile were TPP—but not RCEP—parties, while China, India and Korea and most ASEAN countries, including Thailand, Indonesia and the Philippines, are RCEP—but not TPP—parties. In addition, the RCEP is still under negotiation, whereas the TPP has been signed and awaits ratification. The TPP is viewed as a "high standard," "transformational" agreement with ambitious provisions unlikely to be in the RCEP covering state-owned enterprises (SOEs), the digital economy, intellectual property, investment, regulatory due process, transparency, labor and the environment. Some TPP provisions are aimed at China on the expectation that it would eventually join the TPP (such as disciplines on SOEs and investment restrictions, protection of encryption products, prohibitions on "made in China" performance mandates and forced disclosure of source code, and penalties for trade secret theft and hacking). The current target for completing the RCEP is by ASEAN's 50th anniversary in November 2017. That goal now seems unrealistic, because developed countries seeking higher standard RCEP provisions are at odds with developing countries focusing mainly on lower duties. At the same time, countries like India are reluctant to open their markets to imports from China. These trends were on display at the May 2017 APEC trade ministers meeting in Hanoi as ASEAN countries and China pressed ahead on RCEP, Japan and New Zealand pushed for TPP-11 and called for a "high quality" RCEP, and the US sought only bilateral consultations. Taiwan was the US' 10th-largest goods-trading partner (US$65.4 billion in total two-way goods traded) in 2016. How could these recent developments affect Taiwan? If the RCEP is completed and ratified, businesses from non-RCEP countries like Taiwan (and the US) will likely be at a disadvantage in competing for business within the RCEP region and in competing for supply chain investment opportunities in Asia. While the US will likely ignore the RCEP for domestic political reasons, Taiwan may be prevented from joining the RCEP due to China's policy. Taiwan's chances of joining the TPP may be better. But if the TPP is not revived, Taiwan could be left outside looking in as the Asia-Pacific region becomes ever more interconnected via preferential trade and investment networks. Economic forecasts had predicted that non-TPP ASEAN countries would suffer declines in exports, investment and GDP relative to competing regional TPP-party countries. If the RCEP is successfully completed, non-RCEP countries in Asia, including Taiwan, are likely to face a similar competitive disadvantage. For example, Korea provides a pointed contrast to Taiwan. Although both countries share similar export mixes and markets, Korea's export performance significantly outpaced Taiwan's from 2010 to 2016 (5.3 percent vs. 1.4 percent). This is true even though Korea's chaebols remain unreformed, its labor rates are higher than Taiwan's, and its currency is less competitive. The likely explanation is Korea's entry into numerous free trade agreements, as well as its advantage in global brands. Taiwanese businesses should encourage Taiwan's government to aggressively pursue opportunities to engage in trade negotiations in the Asia-Pacific region, use their business contacts to build bridges to the various RCEP countries and support the FTAAP. The new US administration’s antitrust enforcement priorities remain unclear, but signs of a less interventionist approach are beginning to emerge. Under the new administration, will antitrust officials feel pressure to consider public-interest issues, like jobs, as a factor in merger review? What does the 2016 US presidential election mean for antitrust policy in the United States? Less than six months into the new administration of Donald J. Trump, what do we know about the president's antitrust merger enforcement priorities? What can we expect from US antitrust agencies in the years ahead? During the preceding Obama administration, the US antitrust agencies pursued a relatively aggressive merger enforcement posture, often in parallel with the European Union's approach to global clearances. This continued a trend of apparently more aggressive government challenges to proposed mergers that began under recent US presidents. With the election of President Trump, the antitrust community has debated the question of how antitrust enforcement under the Trump administration might differ from that of past administrations. Many antitrust practitioners have expressed concerns about the future of antitrust merger enforcement in the US. Some point to statements and actions by President Trump as evidence that his administration might incorporate the populist themes he communicated on the campaign trail into his antitrust enforcement. Others insist the differences will be small and amount to little more than a slight course change to a less-interventionist approach, generally in line with the posture of past Republican administrations. For Taiwanese businesses interested in conducting or financing any transactions that could receive merger review and antitrust scrutiny in the US, battle lines are already being drawn on a number of key topics that will affect how you may do business in the US. While much remains unclear about how the new US president and new leadership at both the US Department of Justice (DOJ) and the Federal Trade Commission (FTC) will impact US merger enforcement, here is what we know so far—and the many questions that still remain. The new Trump administration has not yet filled several high-level antitrust enforcement positions. However, signs of a relatively traditional, less interventionist approach to antitrust enforcement—similar to past Republican administrations—is beginning to emerge. President Trump's antitrust nominees so far, including individuals to serve as Acting Director and Acting Chairman for the FTC's Bureau of Competition and as head of DOJ's Antitrust Division, appear likely to pursue their enforcement objectives through a policy of "regulatory humility," which promotes the idea that markets should be free of "unnecessary" regulation. These new antitrust leaders have expressed the belief that governmental intervention and merger review must include a rigorous application of economics before considering whether to challenge a transaction. Taiwan's foreign direct investment in the US (stock) was US$7.0 billion in 2015, up 14.1% from 2014. President Trump has not been shy about making his views known directly to the public, including through his Twitter account, to an unprecedented degree. His supporters have praised this willingness to share his opinions with the public in such a direct and seemingly impromptu way. But how will US antitrust enforcers react if the president praises or strongly opposes a proposed deal (perhaps with a highly negative label like "Bad. A Job Killer")? Certain transactions—especially ones involving current hot-button political issues—could attract particular scrutiny from this president. In fact, antitrust officials could feel explicit pressure to consider public-interest issues, like jobs, as a factor in merger reviews. Will the Trump administration attempt to weigh jobs as part of the overall merger review process? Current antitrust leadership at the DOJ and the FTC have expressed a renewed focus on intellectual property rights. What role will antitrust enforcers play in preserving and encouraging innovation? This is a major issue that will be closely analyzed under the Trump administration. In addition, how will large global transactions fare under the Trump administration, given the "America first" rhetoric promoted by the president and some of his closest advisors? Recent years had seen a steady increase in international antitrust agency cooperation. Will it continue? These and other issues add to the many unknowns surrounding how the Trump administration and its antitrust leadership will conduct themselves when it comes to antitrust merger enforcement. Only time will tell. However, most signs indicate that the Trump administration will most likely pursue traditional objectives similar to those of his Republican Party predecessors. A variety of financing deals are being conducted these days throughout the region. Significant economic factors and various government policies have been driving financing opportunities, financing structures and the types of deals that have recently closed and are currently being conducted throughout the Asia-Pacific region. 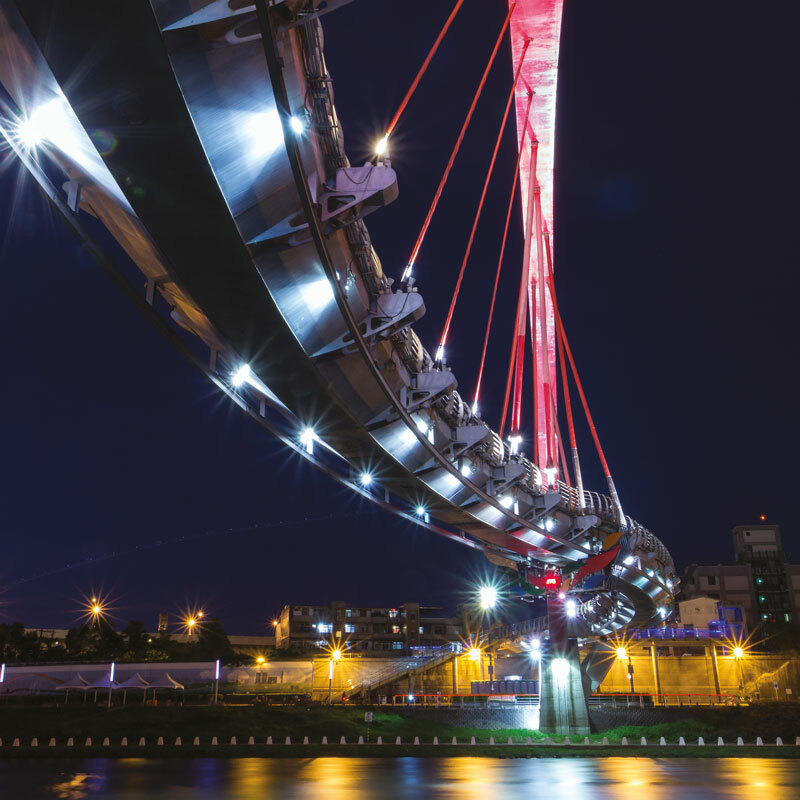 To help Taiwanese businesses and financial institutions make strategic growth decisions, here are our observations on some key financing trends in this region. Despite significant tightening of mainland China's outbound direct investment (ODI) and foreign exchange control policies starting in late 2016, Chinese ODI remains the largest source of financing opportunities in North Asia. Particular recent highlights include ODI by non-state-owned Chinese companies in TMT, manufacturing and retail sectors, among others. We also have been observing a marked increase in Chinese ODI into Europe and other parts of Asia, while US ODI has slowed. At the same time, there appears to be a growing trend of privatization of Hong Kong– and Singapore-listed companies, including several recent deals in the logistics sector, by Chinese strategic investors and international private equity (PE) firms. Given China's tightening of its ODI policy and foreign exchange control policies, financings for ODIs seem to be increasingly sourced offshore from international banks, Hong Kong affiliates of Chinese financial institutions and alternative capital providers. In particular, we have noted a significant increase in Hong Kong–based Chinese private capital providers' participation in ODI financings. Although China has relaxed its inbound foreign direct investment (FDI) policy, we have yet to observe a significant increase in offshore financings for FDIs. Where FDI-related financings are required, we generally are seeing trade financings such as receivables-backed financings and offshore corporate refinancings, occasionally secured by commercial real estate in China. In addition, an increasing number of direct lending transactions with Chinese entities (as opposed to offshore holding company financings) have recently taken place, with a steady pipeline of FDI financings in the clean energy, TMT and financial institutions sectors. In 2016, Chinese companies spent US$140 billion on global acquisitions, almost double the record set in 2015. PE sponsors have been increasingly active throughout Asia. Unlike a decade ago, when PE sponsors relied on bulge bracket investment banks to lead their financing transactions, many PE houses have now formed their own relationships with regional banks in Asia. In particular, Chinese financial institutions have been providing a significant amount of the leverage required in PE-sponsored deals, as well as traditional LBO products, margin financing, dividend recaps and other forms of liquidity. Their coverage has extended beyond China or developed markets and into Southeast Asian countries. China's One Belt One Road initiative (which includes its Maritime Silk Road, Silk Road Economic Belt and various other components) has spurred an increase in infrastructure and power projects in South and Southeast Asia that require financing. Through these and other initiatives, China likely will be critical in shaping the volume, value and character of global investment activity in the coming decade. As expected, Chinese engineering, procurement and construction (EPC) contractors and exporters have been the pathfinders in these new emerging markets. These activities have also had an indirect impact generally on the development of the financial and other economic sectors in emerging markets across South and Southeast Asia. This, in turn, has spurred an increased focus by Taiwanese banks on developing their Southeast Asian business, focusing on project, trade and general corporate financings.